I think it’s time to we pulled ourselves out of this, “on this day, this happened” rut we’ve been in for some time and put something up for no particular occasion, so here’s a good one, for no reason other than the music itself. I hope you’ll enjoy it as much as I do. Autry as pictured on a 1930s Perfect Records sleeve. 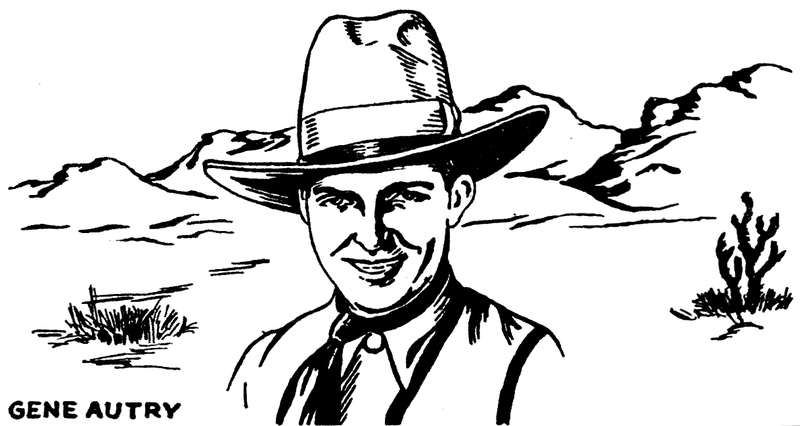 The iconic Gene Autry made his fame in the 1930s as a singing cowboy, much like his contemporary Roy Rogers, but he started his career in the late 1920s imitating another popular singer by the name of Rodgers, Jimmie Rodgers. By the early 1930s, Autry was starting to come into his own, but he still tended very closely to the style of song forth by the Singing Brakeman, as in fact did a great many country singers of that era. On these 1931 sides, you’ll hear Autry perform songs much like those by Jimmie Rodgers. Romeo 5052 (in their country and race series) was recorded February 25, 1931 in New York City by Gene Autry, accompanied on steel guitar and harmonica by Frankie Marvin. It was also issued on Banner 32132, Jewel 20052, Oriole 8052, Perfect 12695, Regal 10310, and Conqueror 7843. The first song is of a solemn tone, a warning to stay on the straight and narrow path, with the singer lamenting his falling in with the wrong crowd and into a life of crime, “’till it led to the use of a gun”, on “A Gangster’s Warning”. 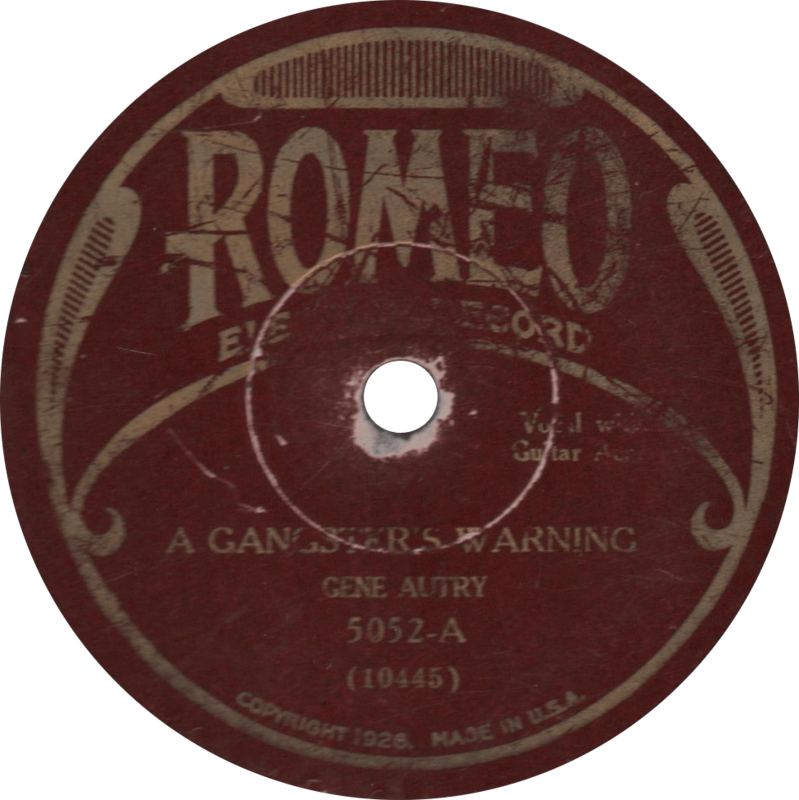 A Gangster’s Warning, recorded February 25, 1931 by Gene Autry. Now, this next side is one of my favorites of Autry’s songs, “True Blue Bill”, also called “I’m a Truthful Fellow”. This song strikes me as a sort of a twentieth century re-hashing of the old “Four Thousand Years Ago”. It seems that this side was a favorite of a previous owner as well, as it’s been quite well played. 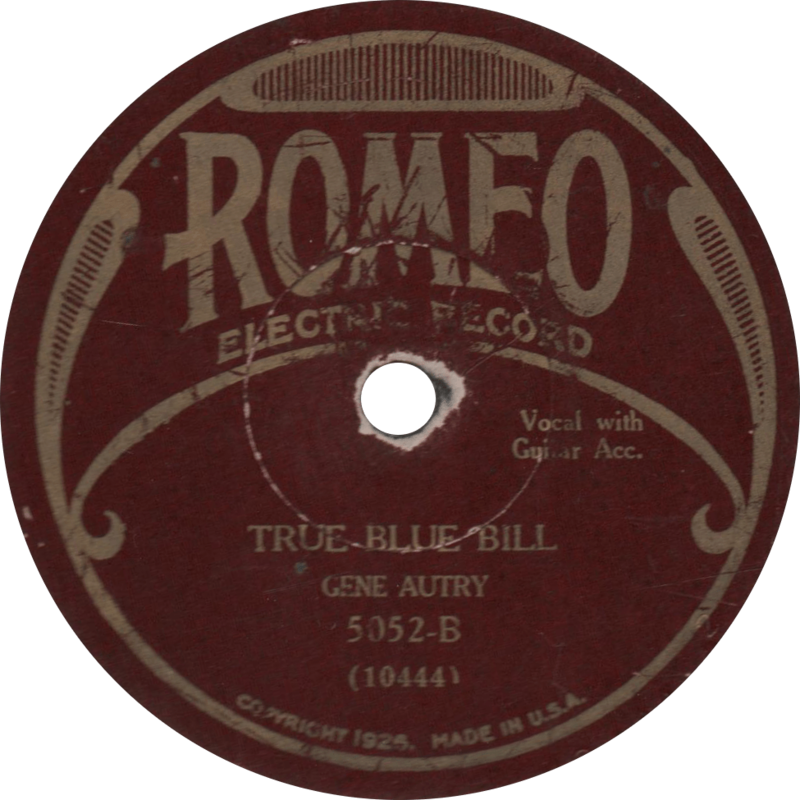 True Blue Bill, recorded February 25, 1931 by Gene Autry. Updated with improved audio on July 17, 2017. This entry was posted in Records and tagged 1930s, 1931, ARC, Frankie Marvin, Gene Autry, Hillbilly, New York, Romeo by R. Connor Montgomery. Bookmark the permalink.